Make a few cozy nooks for students to gather in the back of the classroom and also another small table in the front for students to go to for group work near my desk. Moving a book shelf next to my teacher desk where I will display read alouds. Bring my kidney bean table where I do small group conferences into the center back of my room closer to the student tables. Making the classroom more open and less crowded. I got rid of book bins I had on the shelf next to my windows. Putting some of the student tables diagonally so it’s a better use of the space. Getting rid of stuff that was stored underneath one of my walls, so it’s more open and kids could read underneath there. Another small tweak I made this year is I got rid of the name tags that I would tape onto my desk. I want my students to move desks more frequently and it was always a pain having them move around our clunky individual desks. It caused a lot of noise and was like mini-bumper tables when it was time to move. This year I used these plastic name card holders. They are great, because when I want to move seats, we can just move the plastic name card. If you are feeling stuck with your classroom set up, ask another teacher to stop by and help! I felt like there was nothing else I could do to change in my room, but having a new pair of eyes come in and help rearrange was super helpful. I’ve been trying to find time to read more children’s book, which at times can be difficult, but it does make a huge difference when you’ve actually read the books that you are recommending and encouraging your students to read. These are some newer children’s book that I have in my classroom that I loved reading, and so did my students. These are books I would recommend for students in grades 4-6. Some of the content is a bit more mature and would be better for 5th grade and up. I won’t write super detailed synopsis reviews because you can find those on amazon and goodreads, but I’ll share how I recommend using them as a teacher! Circus Mirandus by Cassie Beasley- My fifth grade class just finished this new book as our fantasy unit read aloud. There are great themes, metaphors, symbolism and figurative language in this story. The students loved this read aloud, and so will you, as you get sucked into the magic of believing in all that Circus Mirandus is about. Echo by Pam Munoz Ryan- This is a book I would recommend for your higher level readers. It is a historical fiction and fantasy book, and goes through different time periods, but weaves the stories all together through this one prophecy. If you have a student reading it, it would be good to check-in with them, and make sure they are understanding the plot and historical background. The Fourteenth Goldfish by Jennifer Holm- This book integrates science so well into the story. Ellie’s grandfather, a scientist, has found a way to make himself young again, and transforms himself into a 13-year old boy. I used this book at the end of the year as a read aloud, which my students were enthusiastic about as well! The Thing About Jelly Fish by Ali Benjamin- I just finished reading this book over my spring break, and I was lying next to my hotel pool in Thailand trying to not cry while I was finishing this book. This book also deals with some mature content. Suzy loses her best friend from a drowning and she deals with that grief and guilt she feels from treating her badly before she unexpectedly passes. Fish in a Tree by Linda Mullaly Hunt- If you need a new beginning of the year read-aloud and all of your students have already read Wonder, this is it. My students enjoyed this read aloud, which is about Ally, who has dyslexia, and struggles to do well in school and is also dealing with bullying. It has many similar themes as the book Wonder. Counting by 7s by Holly Goldberg Sloan- This is another book I would recommend for the high readers in your class. The main character, Willow Chance, is a gifted child, and adopted. When she unexpectedly loses her adopted parents to a car crash, her world becomes drastically changed. She finds a new “family” as she deals with the grief and loss. She is a quirky character, that you really feel for, and root for. You won’t be disappointed. The Honest Truth by Dan Gemeinhart – This is kind of like the kid’s version of The Fault in Our Stars, but with no big romantic storyline. The main character Mark gets cancer again and finds out he doesn’t have long to live. Then, he decides to go on an unforgettable last adventure to Mt. Rainier with his dog as his sidekick. It’ll be a book that you and your students won’t be able to put down. It could also work as an end of the year read aloud. Crenshaw by Katherine Applegate – I’m a huge fan of Katherine Applegate’s books like Home of the Brave and The One and Only Ivan. If you loved those books, you’ll like this one as well. This book is about a boy dealing with homelessness, so the topic is a bit more mature. El Deafo by CeCe Bell- This is a fun and fast read about a bunny who is deaf and needs to wear a hearing aid in school. The themes of fitting in and friendship will make it easy for students to relate to. My students couldn’t wait to borrow this book. Stella by Starlight by Sharon Draper- This is a moving story about an inquisitive and brave girl, Stella, who is living in the segregated south and witnesses the Ku Klux Klan in action. It would work great as a read aloud or if students read it independently, some preteaching on the historical time period would be helpful. What are some new books that you recommend for our classroom libraries? During our previous unit of inquiry my first graders discovered the world of maps. As part of their studies we learned about landforms and landmarks. In order to create a more hands on experience for them I decided to bring in marshmallows and toothpicks. I got this idea because it was the 100th day of school and my PYP coordinator told me that once she gave students 100 marshmallows and 100 toothpicks to create something… and I thought, why not landmarks? Did I give them 100 marshmallows and 100 toothpicks? Uhh… no. But the fact that Korea now has affordable marshmallows available at Diaso (kind of like and up-scale dollar store), is incredible. Good job, Korea! The students worked in pairs to create a landmark. They attempted to recreate the Eiffel Tower, the Leaning Tower of Pisa, the Great Wall of China, as well as make their own bridges, towers, and statues. What are some of your favorite hands on learning engagements? My new first grade teaching partner this year is going to teach me a lot of fun new things, I can already tell. Pretty amazing right? 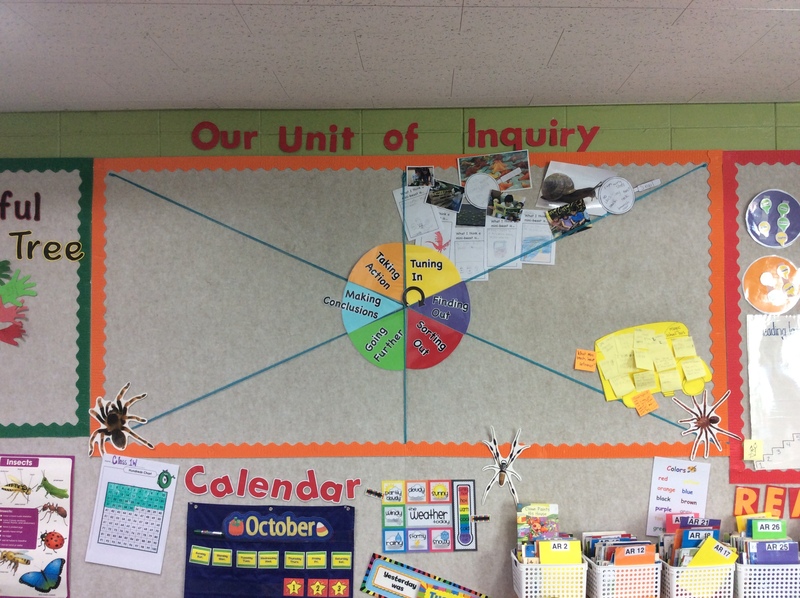 The students were able to see a visual fill up week by week as they journeyed through the inquiry cycle that is tuning in, finding out, sorting out, going further, making conclusions (reflection), and taking action. I obviously had to create a board like this in my own room. 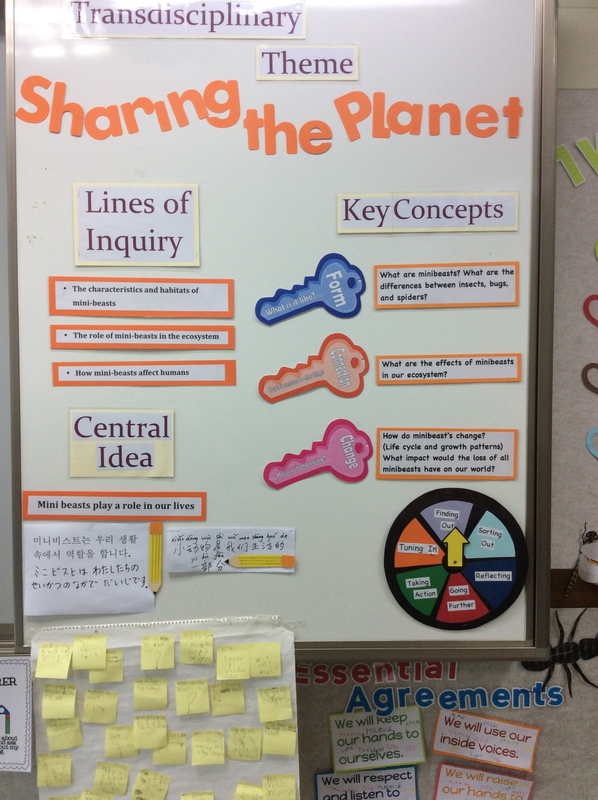 Here is what it looks like after we had our tuning in learning engagements for the first week of our Sharing the Planet unit with the central idea: Mini beasts play a role in our lives. You’ll notice that under my central idea I have it translated into Korean, Chinese, and Japanese. I have students in my classroom who speak very little English, during this unit I had them guess what words they thought would be in our central idea, many of them said “mini beasts” and were very excited to hear what the central idea was, then when students heard it in their mother tongue they got even more excited. The questions on post it notes are questions my students wrote when they came into our changed classroom atmosphere the first day of our unit. I love giving time for my students to ask questions! 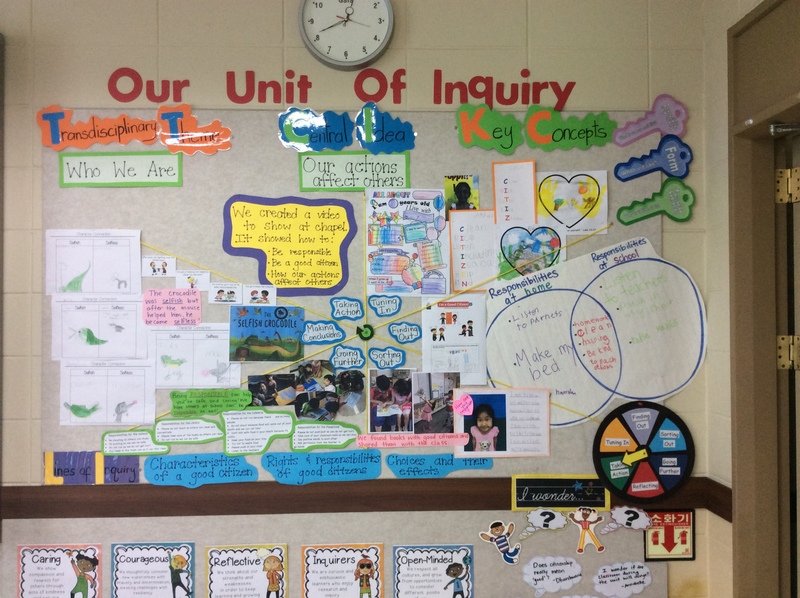 How do you display your inquiry cycle in your PYP classroom? How do you have students ask and answer wondering questions? *Here is what my board looked like at the end of the unit!